Step 1: Make a list of everything you are planning to grow. 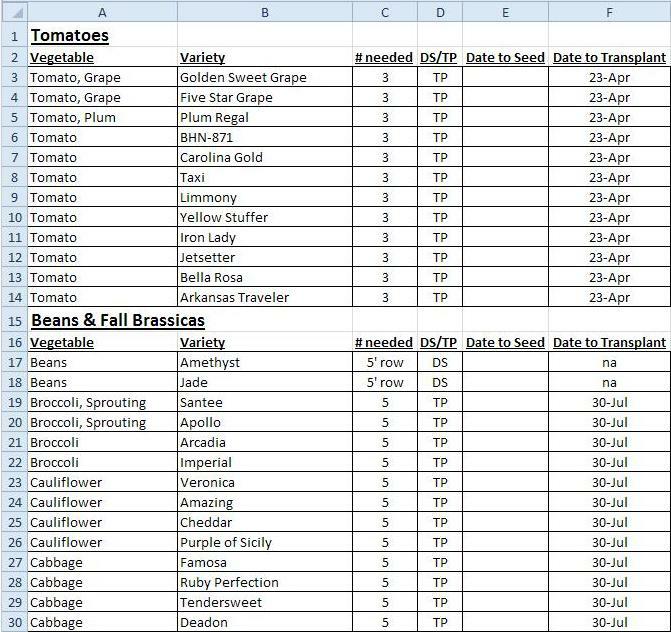 This might seem very basic, but not everyone makes a list before planting! There are people that just go buy plants and seeds and stick them in without even considering anything else. 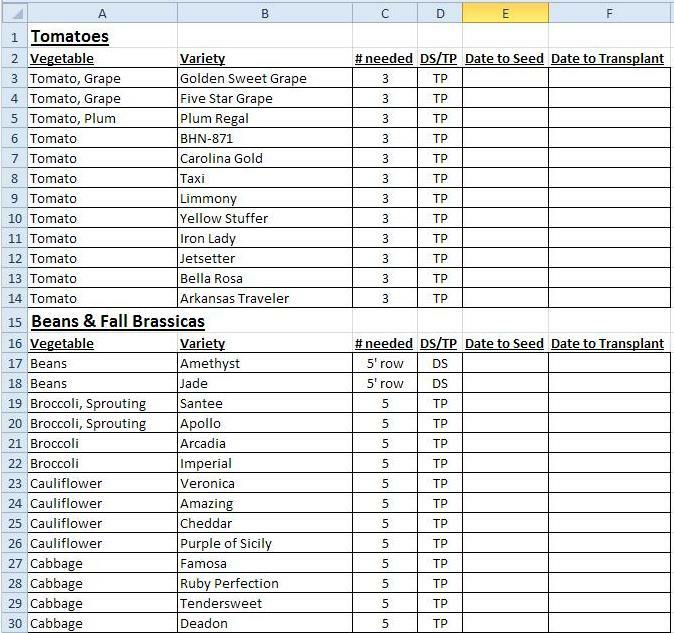 If you were ordering seeds from a catalog, you probably already have a fairly comprehensive list. Here’s what my list currently looks like. Step 2: Figure out what you need to start from seed indoors. This step isn’t always as straightforward as you might think. A number of things can go either way. For example, lettuce. Are you going to direct seed it into the garden or are you going to transplant it? Are you harvesting it for baby salad leaves or as a whole head? Sprouting Broccoli? I don’t know…I’ve never grown it before! In the picture above, you can see I have a column marked DS/TP. That is my code for Direct Seed/Transplant. I’m going to go through the entire list and fill in one or the other. This way I can sort my list by that characteristic later if I need to. It also gives me a quick reference for when I’m filling in the other columns so I don’t have to think. Step 3: Decide how many of each thing I’m going to plant. 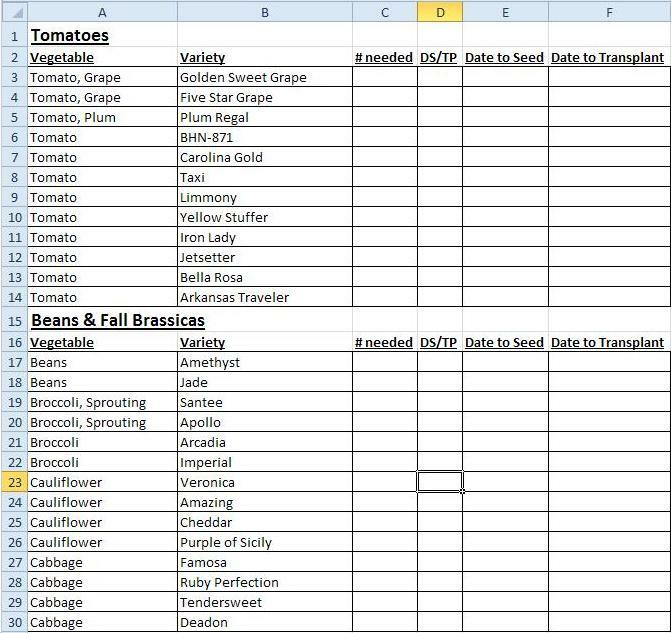 Step 4: Determine when you are going to be transplanting all of these different vegetables. Trust me. You have to decide when they are going out in the garden before you can determine when to start them. This year is a little trickier than normal, because we have a lot of things that are going to be transplanted in the latter half of the summer. If it is horribly hot, I would probably prefer to wait until August to plant. If it is an average summer, we could plant just before Tomato Day, which would be nice. Refer to page 3 of the Vegetable Garden Planting Guide to see approximate “plant outside” dates. 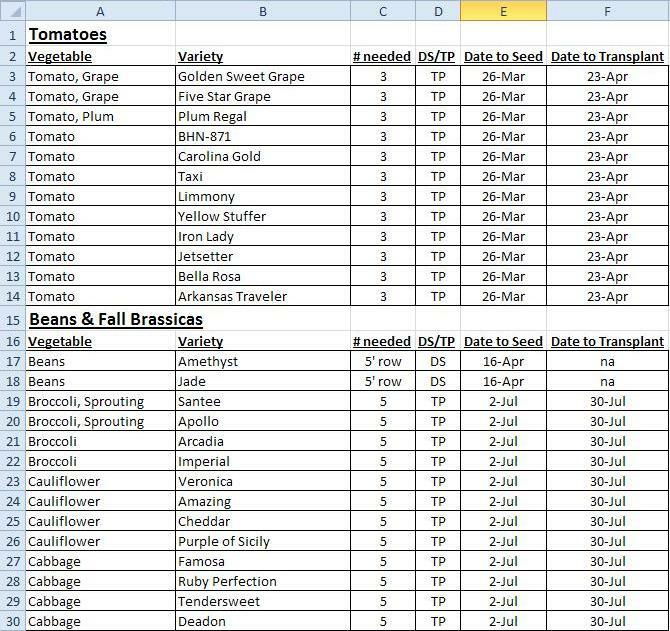 Step 5: Decide how many weeks you need to grow something and count back on the calendar from the projected transplant date to the projected seed planting date. I typically allow 4 weeks to start tomatoes, because they are usually plenty big in that time. I would rather have them slightly small than slightly big. Basil is a quick grower, so that gets 4 weeks as well. Peppers and eggplant can be a little slower to germinate, so I will allow 6 weeks for them. In the fall, most of the brassicas only need 4 weeks to be large enough to transplant. Here you can see the completely filled in spreadsheet. This is the base plan, divided by garden. From here I will manipulate it so that everything is in chronological order. That way we don’t forget to plant something! If you are looking for some more in-depth information on seed starting, here’s another article: Seed Starting. While most gardeners consider temperature to be the limiting factor in growing vegetables during the winter in Kansas, often it is the amount of sunlight that truly limits plant growth, because row covers and other techniques can keep very cold hardy plants alive throughout the coldest part of the winter. From November 20th to January 20th there is less than 10 hours of daylight in south central Kansas. Most fall planted vegetables will exhibit extremely slow growth during this time period because there is not enough sunlight to encourage more growth. Any vegetables still alive during this timeframe should be either harvested and enjoyed or protected for growth to resume in the early spring. If you are planning to overwinter any vegetables or keep them past mid-November, you should plant early enough that they are mostly mature by mid-November. In south central Kansas, our average low temperatures throughout the winter months show that we can successfully sustain many of our cool season vegetables throughout the winter. Although we can have winter low temperatures down below zero, many vegetables will be able to tolerate those short-term low temperatures if given adequate protection with row covers and mulch. While heat is the biggest challenge when planting your fall garden, by the end of fall there is the challenge of cold weather. In an average year, the first light frost will usually occur in mid- to late October, although sometimes the first frost occurs sometime in November. 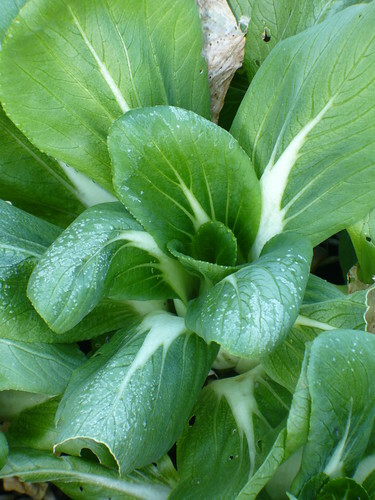 A light frost, where the low temperature dips down to 30-32 degrees will not damage fall vegetables. 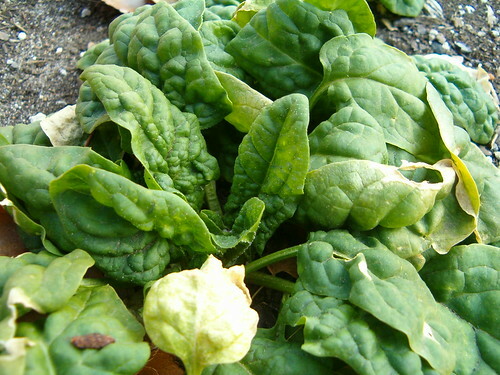 The cold may even improve the color and flavor of the vegetables. Most fall vegetables will tolerate temperatures down to 28 degrees without significant damage. In fact, allowing exposure to below-freezing temperatures will often allow the plants to better adapt to the cold, increasing their hardiness to later cold weather. On a cold morning before the temperature is back above freezing, your plants may look wilted and permanently damaged. However, by the time the temperature is back above 32 degrees, they will recover and continue growing. It is important not to harvest these fall vegetables until the temperatures are back above 32 degrees and the plants have naturally recovered from the frost. When low temperatures dip below the mid-to upper 20s, it will be necessary to protect semi-hardy fall vegetables with a light row cover to minimize damage on those vegetables. Some particularly hardy vegetables, such as spinach and kale, will not need extra protection until the low temperature is near 20 degrees. It is usually best to remove the row covers during the day to allow the sun to warm the soil more efficiently when we are still getting intermittent frosts. As we get later into the year, leaving the row covers on may help create a mini “greenhouse effect” and prolong your growing season once we are regularly dipping into the 20s overnight. Okay, I know this is a little bit after the fact, but now you know, right? When establishing vegetables during late summer heat, there are several techniques that can make your plantings more successful. Using shade cloth, mulches, transplanting, and careful watering will all improve your fall garden success. A white or black, lightweight shade cloth can be used either close to the soil surface to help with seed germination or 1-2 feet above the ground to provide light shade to seedlings and transplants. The shade cloth will help cool the soil and the air temperature around the plants, as well as reduce moisture loss from the soil. A shade cloth that is too thick or heavy will reduce the light penetration too much and can reduce air flow, resulting in poor germination or plant growth. The shade cloth should be removed either after seedlings or transplants are well established or when the temperatures become more moderate. Mulches of organic materials (straw, shredded paper, wood chips, herbicide-free grass clippings) have the effect of cooling the soil. They will also help keep the soil more evenly moist when germinating seeds. These mulches can be applied very close to the seeding row or around new transplants. It can be very effective to apply the mulch to an area up to 2 weeks before planting, allowing the soil underneath to cool slightly. Then the mulch can be pulled back for seeding or transplanting later. Later in the fall, mulches can be removed to allow better warming of the soil by the sun to encourage late fall growth. Some fall garden vegetables must be planted by transplants to provide a long enough growing season. Broccoli, cauliflower, cabbage, onions, leeks, and radicchio will all do best if seeds are started indoors 4-6 weeks before transplanting. 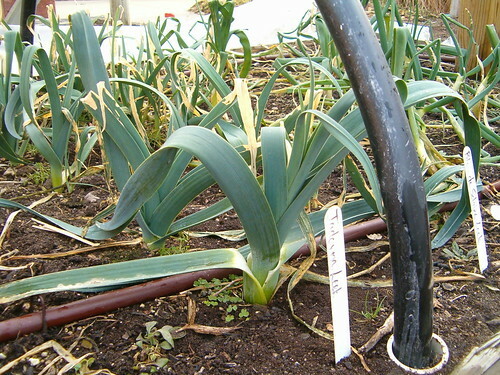 Onions, leeks, and radicchio are often very slow to grow from seed and may need to be started even earlier. Root vegetables (beets, carrots, radishes, and turnips) do not generally transplant well. Starting leafy greens and similar vegetables indoors allows them to get a good start when the weather may still be too hot outdoors. For example, lettuce started in late July will be ready to transplant into the garden by late August, giving you a 4 week head start on your fall lettuce crop. You can then seed additional plantings directly in the garden if desired. When transplanting vegetables in the late summer, it is important to give the plants a chance to adapt to the warm and windy outdoor conditions. Plants should be set outside for 1-2 weeks to adapt to the brighter light and higher temperatures. The first day, place the plants in a protected location with partial shade for only a few hours. Each day for 7-10 days, they should be placed in a location with more exposure to the sun and other elements. During this time they should receive adequate water, but not excessive water so they can adapt to drier conditions. When direct seeding in the garden in late summer, it is important to keep the top 1-2 inches of the soil evenly moist to facilitate seed germination. Typically the seeds will germinate quickly due to the warm soils, and then you will need to gradually reduce watering to encourage deep root growth. Likewise, newly planted transplants may need more water initially, but you should decrease watering quickly to encourage deep root growth. As the weather cools and we experience more frequent fall rains, less water will need to be applied. In some falls, there will be adequate rainfall for a successful garden. Most fall gardens will need about 1 inch of water each week after the heat of the summer has passed.